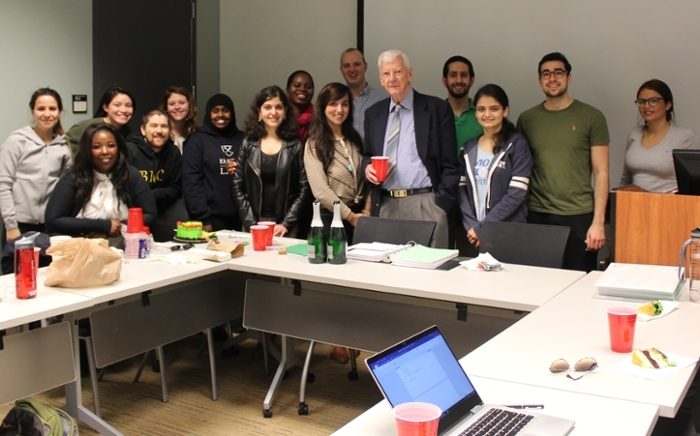 Johan van der Vyver's Human Rights Law class surprised him with a cake to celebrate his 60th year of teaching and his 84th birthday. "He has been so generous with his students," said Rebecca Shoot (JD 2019), noting that he invites students to his home for South African wine night. "I believe his supportive recommendation was integral to helping me secure my dream job for this coming summer, and I know other students have had similar experiences." Van der Vyver, who is I.T. Cohen Professor of International Law and Human Rights, said he was moved by his students' gesture, and he continues to find teaching rewarding. A South African, van der Vyver became active in the 1980s in a group of Afrikaans-speaking legal academics who met with the African National Congress (ANC) to design a democratic constitution for South Africa. CSLR alumnus Matthew Cavedon (JD/MTS 2016) interviewed van der Vyver about his long history advocating for racial justice in South Africa. Van der vyver came to Emory Law in the early 1990s to work with CSLR Director John Witte, Jr. Go here for more about van der Vyver's work at Emory Law.